As we near the end of the year, we wanted to take a moment to thank you for the time, energy, commitment, and trust [and personal information] you’ve shared with us in 2009. With sharing in mind, this year we’ve decided to do something a little different. We hope you’ll find it fits the spirit of the Christmas season. We’re looking forward to working with [working on?] you to build lasting success [for our corporation/international quasi-monopoly] in 2010. According to the recently published accounts for Google UK for 2008 on £1.6 Billion of ad revenue from this country Google UK paid £141,519 in corporation tax. Our Google Team avoided £450M of UK corporation tax by channeling all its advertising earnings from UK customers through its Irish subsidiary. Now Ireland’s got problems of its own of course but all signs are that Google doesn’t give a monkey’s about them either – Google’s Dublin operation’s latest accounts show that only €7.5m of tax was paid in the Emerald Isle in 2008, even though the lion’s share of Google’s €6.7 billion European earnings went through Ireland. 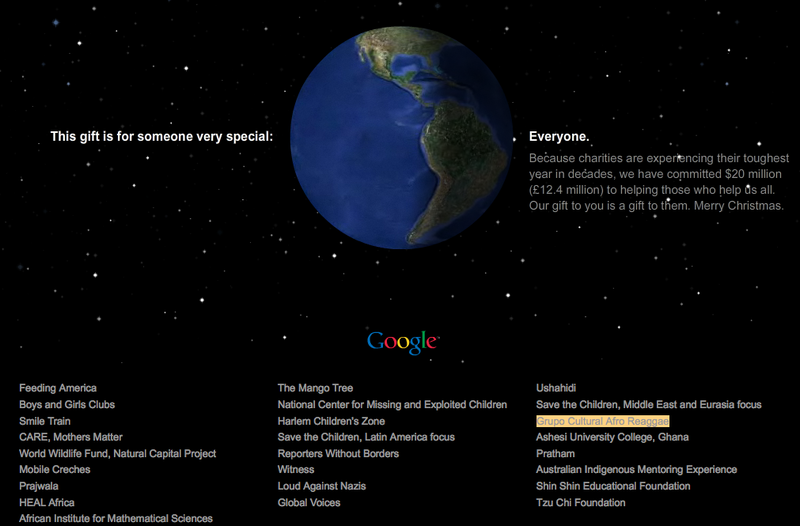 In that same year of £1.6 Billion UK revenue Google UK donated £5,662 to charity. 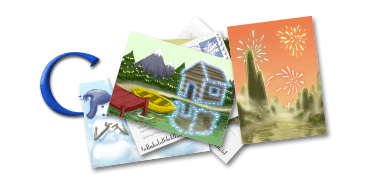 Google is putting back graphic design by years with its second-rate illustrations, not least over these holidays. I’m being a bit silly of course but there is a fundamental issue here – it’s a fundamentally parasitical entity, sucking ad revenue off to the US (some 13% of Google’s global revenues now come from the UK) without putting much back into this country and not really caring about it. Which is why a message like the above rings so hollow, more balls than (jingle) bells. And on that metallic theme, why I won’t be embracing Chrome at the expense of much less evil Firefox. I completely agree that Google should somehow be forced to pay corporation tax sensibly, but you can see how this happened – it’s not that Google are even doing this ‘intentionally’ as it were, it’s just good accounting, and someone doing their job well. Funny you mention the logo changes, my mum did over Christmas too, saying it made her actually angry since she once so enjoyed the simplicity of the logo and now every other day it’s one piece of tosh or another. Typically Gallic reaction. They may be better focusing on issues like the Corporation Tax Google is avoiding in the countries where the revenue is actually generated.